Whereas first wave coffee is characterized by increased accessibility and consumption, and second wave coffee by specialty flavors and the social experience of sitting down at a cafe (think: Starbucks), third wave coffee has forged the most meaningful relationship between customer and cup thus far. Third wave coffee, which took off during the mid-90s to early 2000s, means that roasters focus on transparency, seasonality, and customer experience. Fair and direct trade practices are central to the business, and customers can learn exactly where their beans came from and how growing partners and farmers are treated. The devotion to the craft and ritual of coffee is clear from the moment you walk through the doors of the beautifully designed coffee shop, and though your cup of joe is expensive, you have to admit — you can taste the difference. 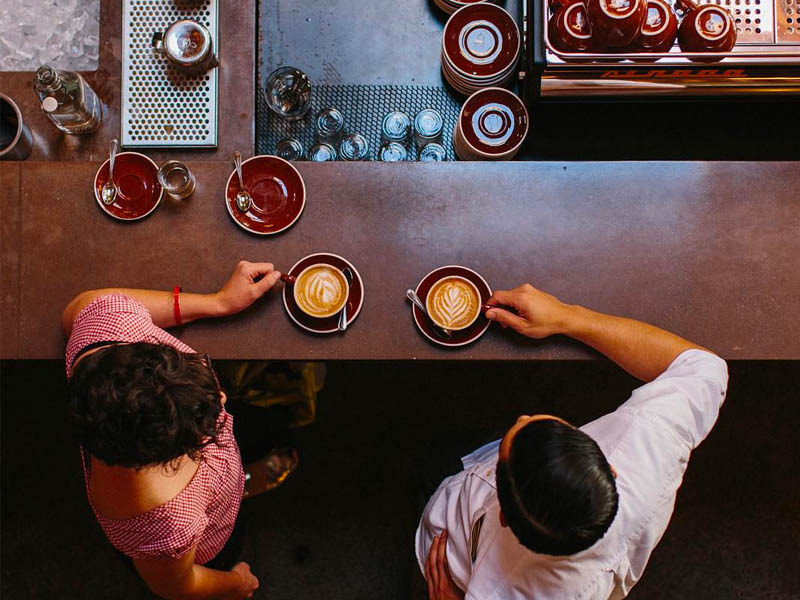 More often than not, these third wave coffee shops in San Francisco, Portland, New York City, and other major hubs aren’t casual pit stops on the way to another destination. They are the final destination, and coffee lovers can’t imagine a more exciting pilgrimage than the trek to obtain this specialty coffee. While visiting the coffee shop is the best way to enjoy its blends, the next best option if there’s no location near you or you want to make it yourself at home is to find it online. Knowing that bags from these coffee roasters are stocked in your pantry, you’ll wake up eager to start your morning routine. Check our our guide to gifts for coffee lovers here. The Chicago-based Intelligentsia says it’s the first specialty coffee company to adopt Direct Trade practices, meaning it collaborates directly with the coffee grower, the grower must commit to sustainable environmental and social practices, and growers are paid at least 25% above Fair Trade price. Its sweet and syrupy Black Cat Project Espresso is a flavorful standout. In 2017, Nestlé took a majority stake in this Silicon Valley favorite, which had raised $117 million in funding. It sells single-origin whole bean and ground coffee at their peak freshness, which you can order by the bag, or have delivered to you automatically through its subscription option. Philz is being called the next Blue Bottle, having raised $75 million to continue its dominance in the Bay Area and expand beyond. The quirky shop offers a wide range of blends, and its Mint Mojito Iced Coffee has inspired many an internet copycat recipe. Based on how packed its cafes always are, it’s clear that loyal customers appreciate its creative coffee and complex flavors.